A lot of people think “assault” and “battery” mean the same thing, but they’re actually two different crimes in Michigan. Also, prosecutors often combine assault and battery charges together, which is why they are so easily confused with one another. An “assault” occurs when a person attempts to harm another person but does not actually touch them. 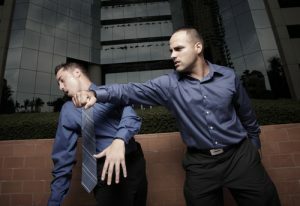 If you swing your fist or an object at someone, but never hit them, it’s still considered a crime. Importantly, you must intend to hit them, and the other person must reasonably fear that you tried to cause injury for an assault to occur. Assault is also any threat of harm made against another person, if it appears the threat is real, and the other person believes they could be hurt or injured. A “battery” is a more serious crime. Battery happens when you actually make contact with another person or an object that person has under their control. If you a knock something out of a person’s hand or a hat off someone, you can be charged with battery. You could even be charged with battery if you strike someone’s vehicle while they are inside the car. The charges of assault and battery are often combined because when someone strikes another person, they can be charged with both the attempt (assault), and the actual contact, (battery). The Different Types of Assault and Battery Charges in Michigan. Assault and battery is a misdemeanor if no dangerous weapon was used in the act. This is known as “simple assault” and, if convicted, a person could spend up to 93 days in jail, pay a $500 fine, or both. Aggravated assault and battery occurs when the other person is seriously injured in the attack. This crime is also considered a misdemeanor. If convicted, penalties include up to one year in jail and a $1,000 fine. If you are charged with attacking a spouse or former spouse, someone you are dating or dated in the past, someone you are living with, or if you have a child with the victim, you could be charged with domestic assault and battery. A first offense includes up to 93 days in jail and a $500 fine. If convicted of a second offense, you could spend up to a year in jail and pay a $1,000 fine. If you have at least two previous convictions for domestic assault and battery, the charge is considered a felony and carries a possible five-year prison sentence and a $5,000 fine. Additionally, aggravated domestic assault and battery charges carry harsher penalties upon conviction. Michigan also provides a “first-time offender plea bargain” for those charged with domestic assault. This plea bargain requires the consent of both the prosecutor and the victim. If granted, a person charged with assault and battery must plead guilty, but the court will withhold entering judgement. The case is then put on hold while the accused completes a series of conditions ordered by the court—much like probation. Once probation is completed, the case is dismissed. However, if the probation is not completed to the court’s satisfaction, the person may be found guilty and sentenced accordingly. Felonious assault and battery occurs when a dangerous weapon is used in the attack, but the perpetrator did not intend to kill or inflict serious bodily harm on the victim. If charged, you could face a prison sentence of up to four years and have to pay fines up to $2,000. However, if the attacker tried to inflict serious harm against the victim, or tried to strangle or suffocate someone, they can be charged with “assault with intent to do great bodily harm less than murder.” This crime carries a possible penalty of 10 years in prison and a fine of $5,000. Assault with intent to maim includes any attempt by an attacker to permanently disfigure a person. Penalties include up to ten years in prison and a $5,000 fine. Assault and battery with intent to commit murder is punishable by up to life in prison. Additionally, felony assault and battery includes any attack or attempted attack on: police officers, emergency medical personnel, utility workers, firefighters, and human services agency employees, while they are operating in their official capacities. I’ve been Charged with Assault and Battery. What should I do now? A criminal conviction can seriously impact your life. If you have been charged with any crime, including assault and battery, please don’t wait to contact our firm at (586) 221-4100. Attorney Goran Antovski and the Michigan Justice team will investigate your case and work diligently to help you determine the best course of action. Only a professional that is familiar with criminal law and the local court system will know how to protect your rights and freedom.